Asbestos Removal Melbourne is a team of licensed asbestos removal specialists with the experience and resources to undertake high quality asbestos removal services at all levels: residential, industrial and commercial. 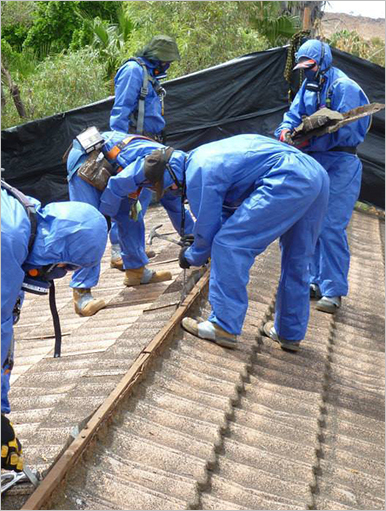 Asbestos Removal Melbourne offers a full range of asbestos removal services to all areas in Melbourne. Our goal is simple: to help all Melbourne homes and businesses be free of asbestos. We work according to your removal needs so that your health and safety is not compromised by asbestos, and we operate efficiently and as timely as possible, so neither is your work. We take no risks and strictly adhere to all relevant safety measures and Environmental Protection Authority (EPA) regulations to ensure we provide you with the best service possible for all customers. We operate carefully in accordance to regulations and pay close attention to detail to keep your home in good shape throughout the process. We offer a full range of residential removal service so you don’t have the extra hassle of contacting multiple parties for different jobs. Our specialist team is also experienced in industrial asbestos removal. We always operate with care and efficiency to ensure all asbestos items are completely removed from your industrial properties and structures. We understand the costs and concerns of stopping business for maintenance procedures. That’s why we always start with an in-depth consultation to assess your needs and determine the best course of action so we can minimise disturbances to your workplace and work in a timely manner, within limitations of work amount. At Asbestos Removal Melbourne, we are not faceless contractors who will rush to finish a job without any question; we are asbestos removalists who understand every situation is different and focus on the individual needs of every unique client. That’s why we always provide a free of charge, initial on-site consultation, so that we can understand your needs, get an idea of the problem and make sure you too, understand the process to be undertaken. We also offer waste removal and ensure we collect all asbestos waste materials for pick-up and ethically dispose of them in EPA registered landfills.